Boating accidents can cause serious injuries, and because help may be far away, injuries that could have been treated on land can result in fatalities. The majority of cases do not result in fatalities. However, fatalities do happen, especially when inexperienced and operate motorboats recklessly or at excessive speeds. If you or a loved one been injured in a boating collision, or if a family member has been killed in a boat crash, you will need the help of a boating accident attorney. The boating laws are complex and failure to follow proper legal procedures could jeopardize your legal right. An experienced California boat accident lawyer can help protect your rights after a boating accident. Most incidents are caused by careless or reckless operators, who cause injuries to innocent victims who are responsibly enjoying the waterways. After a boat collision, a San Diego boat accident lawyer will obtain any reports from the California Department of Boating and Waterways (DBW) and can perform an independent investigation in order to nail down the cause of the collision and hold the negligent boat operators liable for your injuries. Also, if you have not filed proper reports, we can file reports with the DBW on your behalf. More than any other vessel, motorboats cause the most boat accidents. More precisely, it is negligent operators of motorboats that cause most collisions at sea. Many collisions are also caused by commercial shipping vessels that are being operated by tired boat operators who are fatigued. According to the United States Coast Guard, the most common causes of boating accidents are: a boat operator being inattentive, the inexperience of the sailor, an inattentive lookout who is not paying attention to the waterway, speeding, and consumption of alcohol. In fact, boating while intoxicated with alcohol is one of the most common causes of boating accidents in California, accounting for about one third of all boat crashes. If you have been involved in a boat crash caused by a boater who was drinking alcohol while boating, you have legal rights. You can bring a claim both against the negligent operator who was boating under the influence of alcohol, and you can bring a claim against the owner of the boat. When a boat crash results in a boat capsizing, the victims on the boat may drown unless help arrives in time or they have adequate floatation devices. Also, a boat collision could result in a person being through overboard and drowning. On commercial fishing boats, explosion or fire on board often leads to serious injury or death of workers on board the vessel. If your family member has been killed as a result of a boating crash, a San Diego boat accident lawyer at Injury Law Group can help you and your family hold accountable the person who caused the loss of your loved one, and obtain financial compensation for the loss of companionship that you are suffering. Contact Injury Law Group and speak to a boat accident lawyer California. We are dedicated California boating accident attorneys. 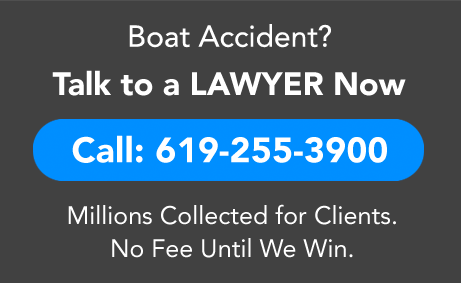 We will fight for your legal rights after a boat collision to hold careless or reckless boaters accountable for your injuries or loss, while you and your family can focus on recovery. Call 619-255-3900.